Do you ever sit back and assess your life in terms of what you've accomplished and what you'd like to accomplish? Every so often I stop to think about my family, my career, and of course life after retirement. Sometimes it's for a few minutes and sometimes it's for a few hours. As a teacher who lives in the Bay Area, I have accepted that I'll never be rich. Cost of living here is insane. I recently talked to one of my neighbors and he told me they pay $2,700 for their two bedroom townhouse. Do you know how many Tony Gwynnrookie cards I could buy for that kind of money? Luckily I was fortunate enough to buy my townhouse before prices soared... but unless I win the lottery... it doesn't look like I'll ever fulfill my dream of purchasing a house here in Silicon Valley. On the other hand, I have been actively pursuing another dream of mine. Ever since I was a teenager, I have wanted a Volkswagen Karmann Ghia. 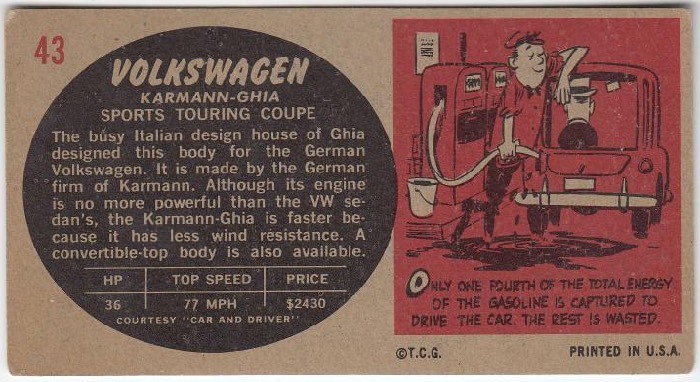 I've owned threeVW Bugs and a pair of VW Squarebacks in my lifetime, but when the time comes... the sixthVW I own will be a Ghia. Until then... 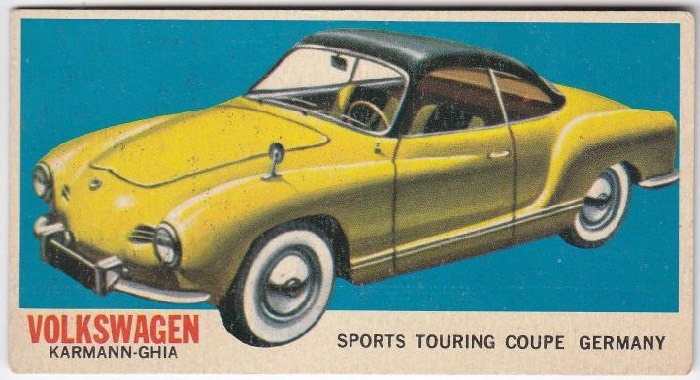 I'm content with finally purchasing a 1961 Topps Sports Cars Karmann Ghia. I've actually added about fifteen cards from this set to my collection and after reading a post on The Shlabotnik Report, I guess I'm not the only blogger who enjoys these cards. Not sure if I'll actually attempt to build this set or not, since I already have a bunch of other sets on my plate. 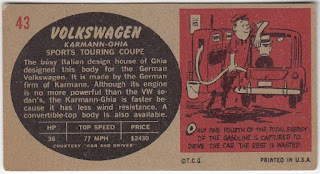 Plus... my cardboard budget has already been cut down as I set aside extra money for my dream car. P.S. I apologize for the abundant use of the word "my" in this post. I wonder what my shrink will say about this.